(CN) – The greater sage grouse is once again at the center of a heated land-use dispute, pitting environmentalists against industry representatives seeking to develop natural resources. Conservation groups filed two nearly identical lawsuits in federal courts in Idaho and Montana on Monday against Department of the Interior Secretary Ryan Zinke and the U.S. Bureau of Land Management. Plaintiffs in the Idaho lawsuit include the Western Watersheds Project and the Center for Biological Diversity. The Montana suit was filed by the Montana Wildlife Federation, The Wilderness Society, the National Audubon Society, and the National Wildlife Federation. It also adds Donato Judice, Montana Bureau of Land Management deputy state director, as a defendant. The conservation groups claim the agency’s new policy of allowing oil and gas development in habitat critical to sage grouse is illegal. Lucas is with the nonprofit group Advocates for the West. The lawsuits challenge two policies enacted by the Trump administration in the past year. The first rolled back a hard-won compromise forged between western states and the federal government that aimed to protect the sage grouse’s habitat while keeping the species off the endangered list, which critics feared would have completely hindered economic development on wide swathes of federal land. The second policy mandates alterations to the approval process by which oil and gas companies seek and receive permission to drill on federal lands. The conservation groups argue that the changes are meant to exclude the public from the decision-making process, making it easier for oil and gas companies to exploit public resources for private gain while fouling the natural environment. Zinke has been upfront about oil and gas development on public lands being a priority for President Donald Trump in his quest to make the United States a dominant force in the global energy market. “The pilot light of American energy has been re-lit by President Trump, and the president’s energy dominance strategy is paying off,” Zinke said in a statement released by the Department of the Interior a couple weeks ago. Zinke has also argued that royalties from oil and gas projects on public lands help fund conservation efforts. According to the secretary, the changes to approval processes are not meant to exclude the public but to streamline the applications and make processes more predictable for industry representatives. But Monday’s lawsuits make the case that these policies are not only illegal, but will endanger one of the American West’s iconic species. The sage grouse, with its distinctive and inimitable mating dance ritual, has steeply declined in population over the past 100 years, largely due to habitat destruction resulting from energy development and residential home building across sagebrush ecosystems. 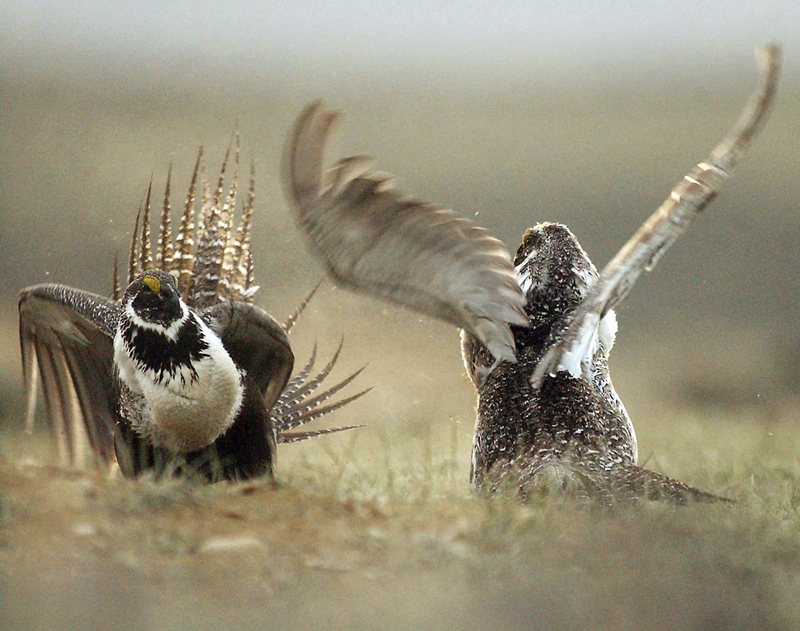 According to the Fish and Wildlife Service, sage grouse once numbered up to 16 million birds spread across 16 western states and three Canadian provinces — including British Columbia, Alberta and Saskatchewan. Today, population estimates range from 200,000 to 500,000, meaning the bird is recognized as endangered by a variety of state-sponsored and independent wildlife organizations. Although the federal government considered listing the sage grouse under the Endangered Species Act during the Obama administration, Republican-led states such as Utah, Nevada and Wyoming opposed the move. All three states have substantial percentages of federally managed land that would be subjected to more stringent land use restrictions if the sage grouse received listing. Sally Jewell, who headed the Department of the Interior under President Barack Obama, eventually fostered a compromise that stopped short of listing the sage grouse under the Endangered Species Act, but stipulated various grouse habitat protections on federal land throughout the West. The Department of the Interior declined to comment on the lawsuit.